A note about bullying-related websites: There are a large number of bullying-related websites (e.g., a google search for the term 'bullying' in website titles gets about 700 sites), with the number growing rapidly as media coverage of bullying grows and public awareness increases. However, there are only a small number which are useful and (most important) accurate (based on the science or "evidence-based'). An example of a site not being useful or evidence-based would be a site which promotes the message that bullied children are primarily responsible for ending the bullying (e.g., by getting stronger in some way, or by ignoring the bullying). Thus, there are a relatively small number of sites listed below as recommended. We have not yet visited many of the bullying-related sites and more will be added as we find ones we can recommend. If you have a site you have found useful and would like it reviewed for addition here, please contact Stuart Green at njbullying@yahoo.com or call (908) 522-2581. Coalition organization participants are encouraged to identify recommended sites, and provide a short review. which has advisement by, among others, Susan Swearer, PhD, one of the country's most important researchers and advocates. Stan Davis' website - www.stopbullyingnow.com. And the government's website, www.stopbullying.gov, which has the guidance of Sue Limber, PhD, another of the country's key advocates. The two sites above are both associated with the work of Susan Swearer, PhD, a school psychologist whose base is University of Nebraska at Lincoln. She is one of the folks most associated with the view of bullying as an 'ecological' phenomenon, or a problem arising primarily from the social environment (e.g., of schools). That is, from our point of view, she has a useful, accurate view of what bullying is and how to address it. The two websites listed provide a good range of information on the problem. Recommended! www.bullyinginfo.gov is the new (2011) site at which the federal DOE collects all of its bullying-related information. An alternate address (which may have additional info) is www.stopbullying.gov. www.ed.gov is the site of the U.S. Department of Education. Entering the term "bullying" in the search field results in numerous pages of good quality information about bullying. A lot of it is duplicated by information on the national campaign site (www.stopbullyingnow.org) but still a good introductory site. Sameer Hinduja (Florida Atlantic University) and Justin Patchin (U of Wisconsin) are two of the steadiest researchers and advocates on cyberbullying issues in the U.S. Although Nancy Willard is an oft-mentioned (e.g., here) force on the issue, and provides very useful guidance, researchers such as Hinduja and Patchin provide the important evidence-based underpinning for refining what we know about cyberbullying and (therefore) guiding useful interventions. For several years, through their website (above), they are also helping the community understand the issue. Recommended! "Fight Crime: Invest in Kids" is a national, non-profit organization of chiefs of police and other violence experts and survivors, headquartered in Washington, DC with offices in several states (no NJ office as of yet, but there's one in NY). They do an excellent job of analysis and reporting on bullying; their reports are among the most reliable summaries of what's known and recommended. The website has a number of useful resources (e.g., a tips sheet for families about cyberbullying), which you can access from the home page by typing "bullying" in the home page search field. This is one of the websites of the Committee for Children, an international organization focused on violence prevention, advocacy and enhanced services for children. The material is thoughtful, research-based and generally reliable. The site is easy to navigate and packed with useful information. Bullying is only one of the issues addressed, but everything on the site is bullying-related and supportive. Recommended. This site is a useful 'one-stop shop' for hazing-related material. Hazing is very much in the news these days, but what isn't recognized enough (ever mentioned in stories about hazing I have seen) is that hazing is bullying (negative acts by peers, imbalance of power). (See the Resources page and new handouts for more information.) There are a number of passionate and knowledgeable national experts and advocates for anti-hazing efforts, first of whom is a journalist, Hank Nuwer. He has written several very informative books about hazing and is featured on a national website. One of the two handouts on our Resources page ('myths') is their material. The site is recommended. Run by the University of Edinburgh Department of Education. This site is a model in terms of content and design. 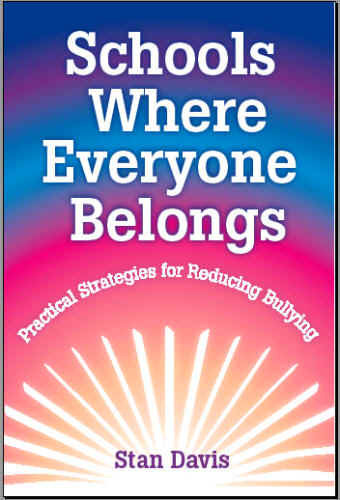 This is the website of Stan Davis, one of the earliest Olweus-oriented anti-bullying advocates in the U.S. Aside from various useful content, the site also describes his wonderful new book, Schools Where Everyone Belongs, which you can order by clicking on the picture of the book. Medline (National Library of Medicine's) has recently added/upgraded its information about bullying. The compiled materials are generally useful, well-referenced and with good perspective on the issue. The lead article from CDC ('what is bullying') is a solid, concise review and there are lots of good materials for public and professionals (the site is a 'gateway' to other sites and materials as well). As usual, we have to read the material before we recommend it: Although most of what's on and linked to the site is good, there are some materials which omit important data or misrepresent the issue. E.g., one of the first links to a Kids health paper talks about children who bully having 'similar problems to children who are bullied', including low self-esteem and family problems - not accurate. On the other hand, the same site has a well done paper on bullying and obesity. Overall, the site is a good starting point and useful resource, and reflects the continuing and growing public focus on bullying. This site (and the organization in various states related to it) was created by the mother of a teenage boy who committed suicide after being bullied. The material is somewhat uneven and largely oriented to legal issues, but it represents a great deal of hard and useful work. This includes an excellent compilation and tracking of those states in which there are bullying-related laws, a good critical review of those laws (and a 'rating' system for the quality of the laws) and - most useful of all - the full text of the law in each state which has passed one. Take some of it (e.g., book recommendations, speaker recommendations, some other material) with caution (although one of the recommended speakers is a known quality - Michael Greene, an NJ Coalition member), but overall a good resource for what it does. www.bullying.org is the website of a Canadian initiative started and maintained by Bill Belsey, a teacher. He has a set of websites (bullying.org, cyberbullying.org, bullyingawarenessweek.org, bullyingcourse.com). Notably, his sites seem free of content promoting 'strengthening' of targets as a primary solution for bullying, and his passion and sense of bullying as a community issue is strong and appreciated. He has a lot of great ideas, has obtained great support and organizational partners, and is evidently doing great work. I find the websites hard to navigate, there's a lot of material on the site submitted by others, of variable quality, there's a lot of self-promotional 'clutter' and the newest site (bullycourse) charges for its services. But there is a lot of information on the sites, of good quality. Worth visiting. This type of computer-based bullying, involving instant messages, cell phone text messaging, and email, among other methods, is apparently growing rapidly. We have no adequate studies yet, as far as I know, but many experts (including the Coalition's Dr. Michael Greene) believe the prevalence is indeed increasing quickly. Cyberbullying may have some unique features, as compared to other forms of bullying: a large population of anonymous bullies and bystanders, all of whom can easily focus on one target, the ability to bully with anonymity, a greater capacity to hide the bullying from adult observation, the ability to rapidly shift focus from one target to another, the ability to use creative methods (e.g., creating short videos) to bully, among other qualities. The three sites above offer reasonable guidelines and information for both children and adults. However, it should be remembered that we do not yet have adequate study of the phenomenon - the information presented is mainly extended from existing expertise on internet safety in general. We should expect that systematic approaches to bullying by schools will also address cyberbullying, but we do not have that information yet. Meanwhile, these sites are a useful start.